Sorry for the inconvenience, we are set for the new date! Thank you for being a member/subscriber! As a worship leader of sound tech, do you struggle with getting a good mix in the house on a Sunday morning? 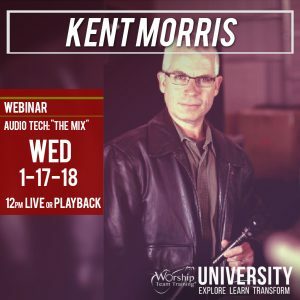 LEARN the dynamics of audio mixing, and how to get the absolute best mix with your equipment for your room from audio expert Kent Morris. Kent Morris: Ministry Training Partner & Instructor – Audio-Tech Mentor Enhancing the quality of audio, video and lighting, Kent has toured as a live sound engineer for well-known Christian artists such as Paul Baloche, David Crowder, Chris Tomlin, as well as Integrity Music, Worship Leader Magazine and has directed hundreds of audio/video/lighting installations in churches, schools and theaters. He writes for online/book publications, consults and teaches at Sweetwater Music. Kent is the President and A/V/L system designer for Cornerstone Media, in which he works with First Baptist Atlanta in being the Lead Broadcast Director for Dr. Charles Stanley. His resume reads like a Who’s Who in the music industry among very well-known artists and producers. Kent heads up the Audio and Technology Instruction and Development for Worship Team Training, and is the Lead Audio/Tech Instructor and Mentor for Worship Team Training.